Most video games comes try to stop powerful players from boosting the hell out of their less-accomplished friends, but Sea of Thieves kind of hopes you'll do just that. Or that you'll work your own way up the ranks. Or that you'll disguise yourself as a newbie swashbuckler and join an unsuspecting crew's maiden voyage, only to reveal your resplendent nature as a Pirate Legend when the mood strikes you. In an interview with Edge Magazine (grab the new issue here), Sea of Thieves design director Mike Chapman made it clear that Rare has no intention to impose a specific progression system on players before they can experience certain parts of the game. Quite the opposite. 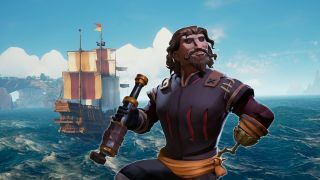 Rare wants Sea of Thieves' first Pirate Legends to feel like celebrities. Remember back in World of Warcraft, how everyone oohed and ahhed at the first folks to hit the level cap? Like that, but with more use for everyone else too - for instance, Pirate Legends can take their less-legendary friends with them into the Tavern of Legends. You can read more about what it's like to be a legend in our own preview of the game from mid-February. Continue your voyage into the Sea of Thieves by picking up the latest issue of Edge Magazine, available now.